A couple of months ago a guy sold most of his vintage shoe collection on eBay. What was unusual about the sale was that he auctioned off about 40 similarly sized shoes and ended each auction at almost the exact same time. Meaning that if you wanted a few different pairs, you had to make choices and couldn’t just wait until to push the bid button on a single pair in the final seconds. This was a big collection of shoes and included both worn and unworn pairs. It obviously took some time to accumulate. If you had a spare $5000, you could have bought all the shoes and never had to buy another pair of shoes. But you would have to accept wearing a pair of Johnsonian shoes for exercising or going to the beach. I think you could do that. I emailed the seller around the time of the auction and he said this about his collection: “I’ve been collecting shoes for about 10 years … I’m downsizing my house and moving which is the reason I’m selling so many. Wife’s making me get rid of them as we won’t have the room in our next house.” A man’s downfall has always been caused by … shoes. And maybe something else. Not surprisingly, a pair of Alden Cigar Shell Cordovan plain toe bluchers (PTB) were the most popular shoes by far. The following two charts show the relative pricing and search hit counts for all the shoes. The seller might have made another $500 or $1000 if he had spaced out the auction end times by 15 minutes per pair. Let that be a lesson to you the next time you sell 40 pairs of shoes. Below is a list of the shoes. It took me sometime to put this together. I am slow. I gave a few comments on each pair. There were four English pairs which I excluded because I only focus on USA and Canadian shoes. I have nothing personally against the English other than giving us the awful Def Leppard Hysteria album. I’ll get over it someday. The next support group session is Friday. Four more to go. Comments: This pair had by far the most search hits. 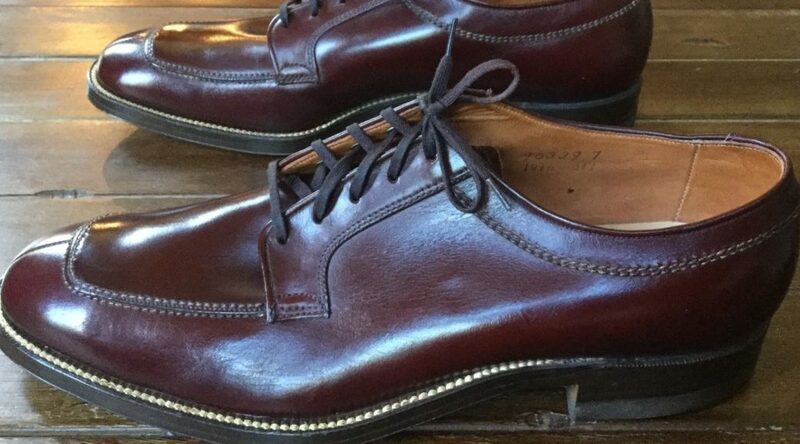 People love (and desire), these rarer Shell Cordovan colors. I like the lighter color of this pair. A new Alden Cigar PTB pair will go for about $1000 on eBay. Used pairs typically go for half of a new pair so this was a good price for the pair. Comments: Not my favorite Alden style. Of the Alden shoes, this pair had the lowest search hit count. The model uses the Barrie last so they should fit more like an 11. Maybe that is why the pair went unworn. $310 for new Alden shoes is a reasonable deal. Comments: This is an interesting pair. The seller lists the leather as “cognac”. It looks like Ravello. It’s a rare color for Hanover shoes but they do appear on eBay from time to time. The shoes are in good condition with light wear. This pair sold for more than I expected. Other used Ravello Hanover shoes have sold for much less. Still, the price is significantly cheaper than a used Alden Ravello long wing. And no one you meet on the street would likely know the differences between an Alden and Hanover long wing. That is our special secret. Comments: The Strand in Walnut calfskin is a fine looking shoe but the Strand in Cigar shell doesn’t do it for me. Maybe its the lighting in the photos. The shoes have a “No Warranty” stamp on the soles so they were likely AE seconds or returns. I would have spent my $300 on another pair. Comments: This is the pair I would have spent the $300 on. I love this pair. It was my favorite in the auction. It is remarkable to find a unworn pair from the 1940s or 50s. This handsome pair has a classic split toe style with hand sewn vamp. The pronounced contrasting welt stitching was popular at the time. It’s a tough shoe to value because we’ll likely never see another NOS version but $260 seems like a good price. Comments: This is one of my favorite Florsheim models. In the early 1990s, Florsheim was falling apart but still managed to produce some excellent shoes with the Royal Imperial line. This pair was a bargain if you compare them to similarly priced shoes at Nordstrom. I tell that to myself all the time. I am saving money by buying quality vintage shoes. The more shoes I own, the greater the savings. Obviously. Comments: Another great pair. I love the U-Tip design and the double leather sole. While the design is very 1950s, these must have been made in the 1984 for the Dack’s 150th anniversary. A fine example of Canadian shoe making skills and design. The winner of this pair also won the above Freeman auction. Not bad, eh? Comments: I am a big fan of the cap toe balmoral. To me, it’s the most versatile shoe a man can own. But I am not a big fan of this pair. The color makes it less suitable for formal wear. And that’s important to me because I work at software company. Very formal. Kidding. The shoes appear to be AE seconds but with very little wear so the price seems right. Comments: These Leeds were in good condition. Decent price. 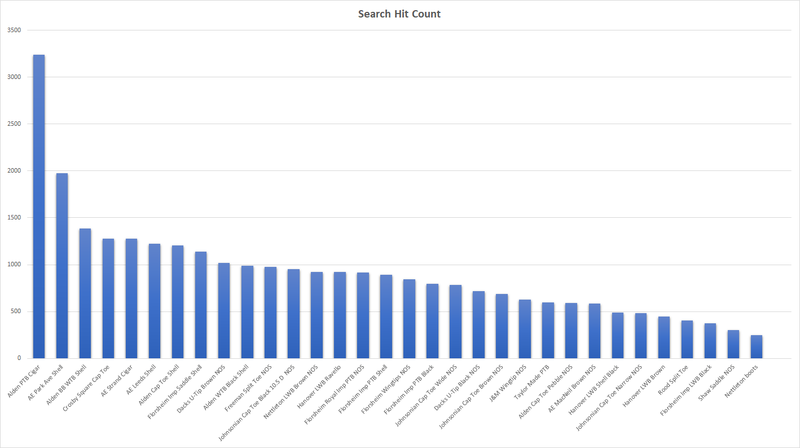 Highest search hit count for a black pair. Kinda boring style. Comments: This pair went for a higher than expected price. For some reason, there isn’t much love on eBay for Nettleton. I have tried to sell similar pairs and they usually attract one or less bidders. Less than one is zero. JSYK. I like the pair but these aren’t Nettleton’s Traditionals line. Comments: This pair was in good shape and sold for less than expected. It was a good deal for the buyer. I liked the color of the pair. Comments: These are an identical pair to the brown version listed above. They sold for less because brown > black. Its true. Check out the hit count difference. Comments: This pair of Florsheim PTBs are in nice condition but went for a premium price. Comments: This might be the best-looking pair of MacNeil shoes that I have seen. And I have seen a lot of pairs. I like the burnish brown smooth calfskin upper. Very handsome. This pair was likely made in the 1960s or early 1970s. It has the older MacNeil design. The newer design started in the late 1990s. Who bought the pair? Me. I couldn’t help myself. I will write about them in a future post. Comments: The seller had three pairs of nearly identical black Johnsonian cap toe shoes in the auction. This pair went for double the price of the other pairs. Why? Because they did. Live with it. I am. Just like I am living with the fact that the The Phantom Menace made more money than The Empire Strikes Back. Comments: These Florsheim saddle shoes are a rare pair and a bit surprising that they went for a price just over the century mark. Saddle shoes are not my favorite style. Why? I can’t really explain it. Sort of like I can’t explain the taste of chicken. Comments: This is a brand that I have no familiarity with. Cole Haan was once Cole Rood Haan. The same Rood? No idea. This split toe Algonquin style is in good shape and with minimal wear. The leather has almost no creasing. A decent deal for $103. Comments: I like the pebble grain on the Dack’s U-tips but it doesn’t work as well on these Florsheim shoes. Maybe its the double leather soles on the Dack’s. What’s funny about me critiquing any of these shoes, is that I would wear them all. Not during the same day though. That would be a bit much. Comments: That this pair got 1280 hits was surprising. Are there really that many people looking for vintage Crosby Square shoes? These are a smart looking pair of shoes. Why didn’t they come in an 11.5? WHY?! Comments: This pair didn’t include a photo of the soles but I assume there was no wear on them. Johnsonian was a brand from Endicott Johnson. The space age “Formula X-1000 Leather” was trademarked in 1964 so I assume these shoes date from sometime after that. Comments: Nice shoes at a nice price. What’s not to like if you are the buyer? Maybe just the heel taps. Comments: Again, I am not a big saddle shoe fan but this is a good looking pair. The brown pebble grain and smooth black leather is a nice combo. The shape of the shoe is handsome as well. I don’t believe the sole is leather though. I have an 1968 Shaw catalog with this model and it lists it as having a “Nuclear sole”. Whatever that means. I would (and will) classify Shaw as value brand. It’s not a sought-after brand and thus had the lowest search hits for any of the shoes. Still, this pair was good deal given that they are true vintage and unworn. Comments: Have I mentioned I like Hanover LB Sheppards shoes? Well I do. This pair looks like it has been worn maybe five times. They have probably 300 more wearings in them. Nice purchase. Comments: The seller’s fourth pair of black PTBs is a cool pair of Taylor Made Imperials. Taylor Made was an E.E. Taylor brand out of Freeport Maine. Does anyone need four pairs of black PTBs? No. But I can relate. I have had the feeling. The feeling of emptiness that only a fourth shoe can fill. Comments: As I have learned, these are technically French toes, not cap toes. You really can’t go wrong with this pair at this price. Unless they don’t fit you. Comments: A nice looking pair. They probably would have gone for a higher price if there weren’t so many competing pairs for sale. Comments: Someone has to be the last kid picked. I don’t think this pair minded. Because shoes can’t think. Yet. I helped him out by snagging the Florsheim Imperial shell cordovan plain toe Bluchers. My first shell purchase. They look even better in person and fit perfectly. Me too! Or even 8.5 EEE. I could make either work. I remember the sale. Unfortunately none in my size which was a bummer…! I’m not sure I would have sold all those shoes… not sure about the wife selling her collection. She must have kept them all so there was no room for his pairs. Wow – there are lots of pairs there that I consider a steal. 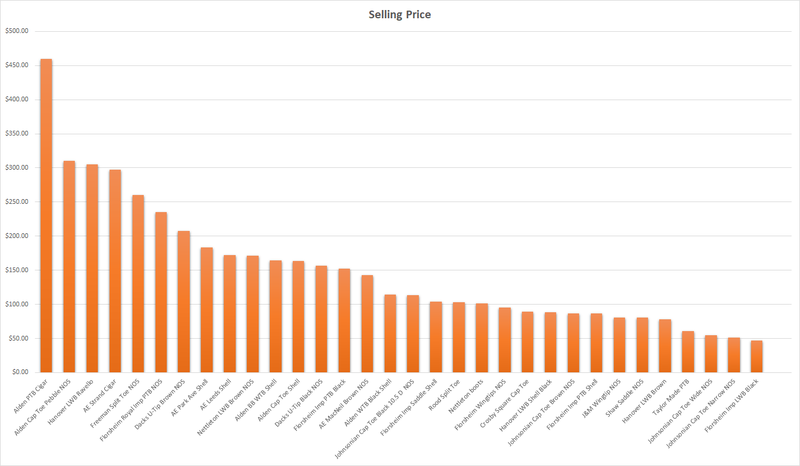 The Cigar Aldens sold pretty low IMHO, especially after eBay and PP. I’m guessing he wasn’t a StyleForum or Reddit GYW guy, but I’ve had good success selling there – I would have tried there first, at least for the shell and more unusual pairs.